Reem Abu-Rustum, M.D. ’93, uses her experience caring for underserved women to educate the next generation. Jan. 17, 2019 —As the 2011 Arab Spring uprisings left many Middle Eastern nations in a state of upheaval, OB-GYN Reem Abu-Rustum, M.D. ’93, recognized a population with an urgent need for care. The expert in prenatal diagnosis and care, then practicing in her native Tripoli, Lebanon, watched as an influx of Syrian refugees flooded remote areas of northern Lebanon. As these women didn’t have access to physicians, she made it her mission to advocate for their health. Abu-Rustum co-founded the SANA Medical Non-Governmental Organization in cooperation with the International Society of Ultrasound in Obstetrics and Gynecology, or ISUOG. Named in memory of a neonatologist Abu-Rustum was very close to, SANA is an acronym for sustain, aid, nurture and assist. By partnering with Médecins Sans Frontières, World Vision International and local agencies, Abu-Rustum and her team provided obstetrical care for populations experiencing high levels of home births and maternal morbidity and mortality. Abu-Rustum’s passion for caring for women in need is an internal fire that motivates her every move, a fire that was sparked right around her 11th birthday, when her father, an OB-GYN practicing in Lebanon, invited her into the delivery room. “My birthday gift was to attend a delivery my father performed because I was so curious. After that, every free second was spent with my father in the clinic or scrubbing in the operating room,” she says. The flames of Abu-Rustum’s curiosity were stoked as she traveled to Gainesville to study at UF. From joining the Junior Medical Honors Program to completing her residency in the UF Department of Obstetrics and Gynecology, Abu-Rustum found a second home on campus. “In medical school, I learned how to be humane, humble, a good teacher and assertive in the gentlest of manners,” she says. 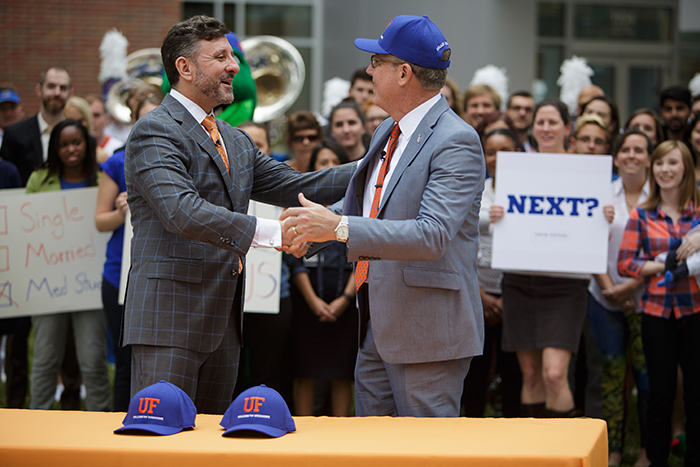 She found mentors in Keith Stone, M.D., and associate dean for student affairs Patrick Duff, M.D., whose office she now occupies as an associate professor in the UF division of maternal fetal medicine. From these two, she learned patient care involves going above and beyond for patients. Following her residency — during which she received the Most Outstanding OB/GYN Resident Award from the UF Medical Alumni Association in 1997 — Abu-Rustum practiced in Tripoli. In addition to her work with SANA, she completed two weeklong missions in Sudan, in cooperation with the ISUOG and Sudan’s Ministry of Health, to educate health care providers in obstetrical sonography. As Sudan has a high rate of maternal morbidity and mortality, Abu-Rustum’s team aimed to identify and care for at-risk women. She calls the experience a highlight of her career. Abu-Rustum’s career came full circle last August when she accepted a position as an associate professor at the UF College of Medicine. Her goal in teaching the next generation of providers is to retain a sense of humanity in patient care. Martin Laguerre, MS3, pursues his dreams of caring for underserved populations with help from scholarship.